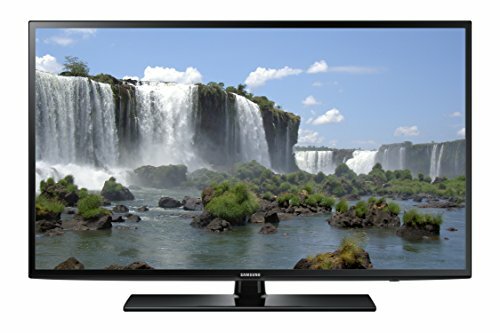 The Samsung UN40J6200 is an awesome smart TV for families and those that enjoy a quality picture and sound. It is simple to use and very nice looking- definitely a good addition to any living room or bedroom. The size is great, and the price is better. It is very lightweight and easy to move. Watching movies and shows on this TV is quite a treat. It is highly recommended! The look of this TV is slim and sophisticated and yet meaty enough to be strong and stable wherever it is mounted or placed. The placement of the TV seems to work in many rooms, but it is probably best in a living room or bedroom because of the size- anywhere else would not really make sense since it is quite big. The stylish design definitely makes the Samsung UN40J6200 a pretty nice addition to a room and does not overpower the décor. It just looks nice and gets a lot of compliments. The look was designed really well. The speakers are in the back, which may be quite common with built-in TV speakers, but it is not the best since obviously it is facing the wrong way to send sound out correctly. The sound is still good somehow- not great, but it is solid and sounds pretty high quality for what it is. A sound system can pretty easily be hooked up to make it movie theater quality, so there is always that option too. There is a slight high pitched squealing or buzzing noise that can hardly be heard but if the TV is quiet, it can get a little annoying. Turning off the TV or keeping it at a decent volume fixes this problem easily so it is not that bad. The inputs are a little less than a lot of other TVs and could leave some people wanting more or wishing they had more hook-ups. If you have a lot of things to attach and hook up to the TV, you may need to get a splitter or something. The visuals are great with this TV- actually superb. This is one of the best displays around, and it makes what you are watching come to life- or so it seems. The features and settings are easy to use so changing them to what you like is not as challenging as with many other TVs on the market. The display is even good in sunlight because of the texture of the screen- it deflects the sunlight somehow, and you can still see the pictures clearly and with great quality too. Even in a room with full sun exposure most of the day, the images never get ‘frozen’ into the screen like some other TVs do, and the TV screen itself does not fade.